Vol 3 | Issue 2 | May-Aug 2017 | page: 34-38 | Michael J. Pedro, Marco Gidaro, Steven H. Cataldo. Authors: Michael J. Pedro  Marco Gidaro , Steven H. Cataldo . Chief Medical Officer, Revolutionary Medical Devices, Inc., 4090 E. Bujia Primera, Tucson, AZ 85718, US. Department of Anesthesiology, Einstein Medical Center, Philadelphia, PA 19141, US. Director of Medical Sciences, Revolutionary Medical Devices, Inc., 4090 E. Bujia Primera, Tucson, AZ 85718, US. 4090 E. Bujia Primera, Tucson, AZ 85718, US. Introduction: Anesthetic type plays an important role for patients undergoing endovascular therapy for acute ischemic stroke (AIS). General anesthesia (GA) offers airway security and immobility but is time-consuming, associated with significant hemodynamic changes, and restricts intraoperative neuromonitoring. Sedation avoids endotracheal intubation, minimizes disruption in cerebral autoregulation, and potentially lowers final infarct volume but is associated with hypoxemia and hypoventilation with an unsecure airway. 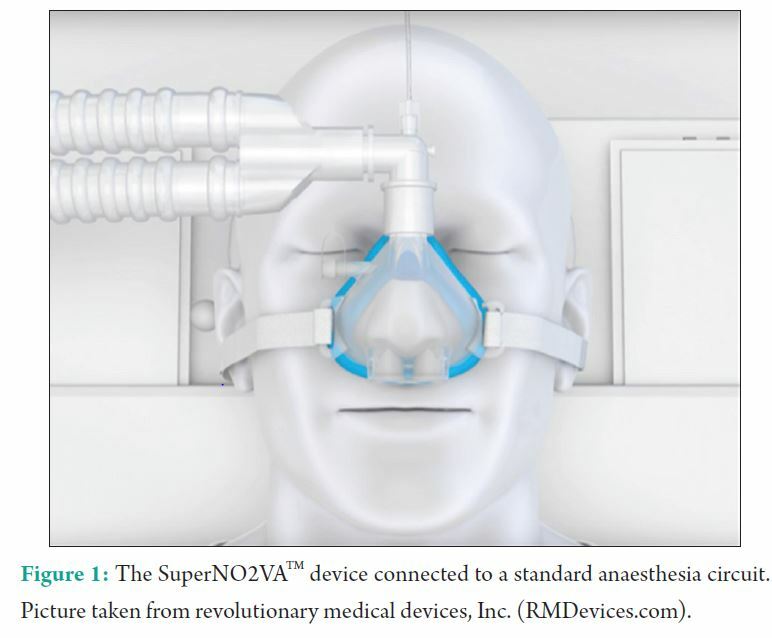 The SuperNO2VA, a novel, no-leak nasal mask, allows for nasal positive pressure generation when connected to the anesthesia machine and is used to non-invasively maintain upper airway patency and provide ventilatory support to patients under deep sedation. Case Report: A 77-year-old, 60 kg, woman with hypertension and diabetes presented to the hospital with incoherent speech and left arm hemiparesis. She was an ex-smoker with a history of multiple episodes of pneumonias with a current productive cough. Computed tomography showed AIS, tPA was administered, and the patient was transferred to neuroradiology for endovascular therapy. The SuperNO2VA, connected to the anesthesia machine, was used for upper airway maintenance and ventilatory support during propofol sedation to avoid GA and endotracheal intubation. Despite her compromised respiratory status, the patient tolerated deep sedation well with nasal variable positive airway pressure and the intraoperative course was uneventful. The clot in the middle cerebral artery was evacuated, and the patient was transferred to the neuro step down unit. Conclusion: Utilizing a sealed nasal mask connected to the anesthesia machine, clinicians may provide nasal positive pressure to maintain upper airway patency and provide ventilatory support to patients under deep sedation. Using fresh gas flows of 10 l/min with a partially closed pop-off valve, this variable positive airway pressure technique provides expiratory pressure equivalent to that set by the pop-off valve with inspiratory pressure achieved passively from the circuit or augmented by manual squeezing of the reservoir bag. This technique may offer clinicians a non-invasive advantage to supplemental oxygen alone during deep sedation, particularly if patients have compromised pulmonary function or are at risk for upper airway collapse. Keywords: SuperNO2VATM, variable positive airway pressure, sedation, airway management, devices. Endovascular stroke therapy focusing on timely revascularization has become a standard of care for acute ischemic stroke (AIS) in specific patients . For endovascular procedures, anesthesiologists are intimately involved in sedating, anesthetizing, and monitoring patients. The anesthetic plan plays a critical role in the success of endovascular therapy as prolonged time to induction, inadequate cerebral perfusion, hypoxemia, and hypoventilation are associated with worse outcomes [2, 3]. Despite the significance of the anesthetic management choice in these patients, the question is yet unanswered as to whether general anesthesia (GA) or sedation is a better anesthetic strategy to optimize outcomes. GA offers the advantages of airway control, avoidance of aspiration, patient immobility, and potentially reduced procedure duration as patient motion during sedation can make fluoroscopic navigation challenging and time consuming [3, 4, 5, 6, 7]. Many patients are full stomach before admission, increasing the risk for intraprocedural aspiration, and depending on the stroke location, may be obtunded or agitated. GA offers good control of patient motion, secures the airway, and avoids high-risk intraoperative emergency intubation. However, GA and paralysis may delay the onset of treatment, exposes the patient to significant blood pressure fluctuations, and restricts neurological monitoring during the intervention . Some retrospective studies have shown improved outcomes in non-intubated patients not receiving GA and/or pharmacological paralysis [4, 5, 6, 7]. They have also revealed increased risk for pneumonia and/or sepsis in intubated patients and in those receiving pharmacologic paralysis [4, 6]. Non-intubated patients for endovascular treatment of AIS have been reported to have a lower final infarct volume appreciated on imaging, diffusion-weighted magnetic resonance imaging studies, or non-contrast head computed tomography, as well as shorter lengths of stay in the ICU . Deep sedation with propofol for endovascular therapy has gained popularity because it avoids endotracheal intubation, minimizes disruption in cerebral autoregulation, and decreases cerebral metabolic rate . However, sedation is not without consequences, particularly when it comes to upper airway obstruction, which may result in hypoxemia and hypoventilation. Of note, sleep-related breathing disorders may be present in 44-95% of stroke patients, higher than the general population and furthering the risk for sub-optimal airway management . In a randomized controlled trial of sedation for neurointerventional procedures, a 25% incidence of respiratory complications (snoring, airway obstruction, SpO2 <90%, or respiratory rate <8/min) was reported despite administration of supplemental oxygen . The following case reports the successful use of a novel nasal airway device, the SuperNO2VATM (Revolutionary Medical Devices, Inc., Tucson AZ), along with non-invasive nasal variable positive airway pressure (VPAP) to maintain upper airway patency and oxygenation during endovascular therapy with deep sedation (Fig. 1). A 77-year-old, 60 kg, woman with a history of hypertension and diabetes presented to the emergency department (ED) confused with incoherent speech and left arm hemiparesis. She was an ex-smoker with multiple previous bouts of pneumonia, currently with productive cough appreciated in the ED. Initial vital signs revealed hypertension at 230/139 and oxygen saturation of 93%, with a Glasgow coma score of 10. Within 10 min of arrival, head computed tomography revealed an acute distal M1 occlusion of the right middle cerebral artery. In the ED, tissue plasminogen activator was administered and an infusion of nicardipine was initiated for uncontrolled hypertension, with a target blood pressure of 150/80. After 40 min, she was transported to the interventional suite to undergo endovascular therapy. On arrival, her physical examination was unchanged. Productive cough was present and vital signs were improved with BP 168/88, HR 78, RR 16, and SpO2 100% on a non-rebreather facemask at 10 l/min. Airway assessment included a Mallampati 2, thyromental distance >6 cm, interincisor distance 4 cm, neck circumference <18 inches, intact dentition, and normal atlanto-occipital extension. Family members confirm the patient had nothing to eat or drink for >12 h before arrival. Due to her uncontrolled hypertension, a significant respiratory history, current productive cough, poor room-air oxygenation on admission, and NPO status, avoidance of GA was preferable to minimize hemodynamic fluctuations, airway irritation, post-operative mechanical ventilation, and difficulty weaning. The anesthetic plan was to give deep sedation with continuous propofol infusion and provide airway support using the SuperNO2VATM device, along with variable positive airway pressure generated through the anesthesia machine with a fixed oxygen flow (Fig. 2). As is standard practice, the procedure room was equipped pre-operatively with all necessary items to convert to GA with an endotracheal tube in the event of respiratory failure or hypoxemia not readily treatable with our approach. After standard anesthesia monitors were placed on the patient, non-invasive nasal VPAP was utilized, where the fresh gas flow (FGF) is fixed at 10 l/min and inspiratory pressure through the anesthesia circuit is lower than the expiratory pressure (Fig. 3). To set up VPAP, the SuperNO2VATM Device mask was placed over the patient’s nose and strapped tightly to create an airtight nasal seal, like that of an anesthesia facemask. With the patient in the supine position, we connected the anesthesia circuit and set the machine to spontaneous mode with oxygen FGF at 10 l/min and the adjustable pressure-limiting (APL) valve at 10 cm H2O. After filling and pressurization of the reservoir bag, the peak pressure read 10 cm H2O, indicating no leaks within the system. An infusion of propofol at 100 mcg/kg/min was started with the goal to achieve immobility through deep sedation. Ventilation was confirmed through the movement of the reservoir bag as well as end-tidal carbon dioxide (EtCO2), from the standard gas sampling line at the circuit elbow. FGF remained fixed at 10 l/min and the APL valve at 10 cm H2O throughout the case. During negative-pressure inhalation, a pressure drop was appreciated in the reservoir bag and through the pressure waveform monitor. On exhalation, the expired tidal volume filled and re-pressurized the reservoir bag, allowing for expiratory positive airway pressure (EPAP) and positive end-expiratory pressure (PEEP) of 10 cm H2O, set by the APL valve. Under deep sedation, the patient breathed spontaneously with no upper airway obstruction or oxygen desaturation as well as continuous EtCO2 visualization. Deep sedation with VPAP through the SuperNO2VATM Device enabled a hands-free technique without any patient movements, procedural interruptions, airway maneuvers, or respiratory complications. Through an endovascular approach from the femoral artery, the clot was successfully aspirated and the affected vessel was subsequently recanalized. The procedure lasted 90 min in duration. In that time, 700 mg of propofol was given, oxygen saturation remained 100% throughout, and there was no significant fluctuation in hemodynamics. At the conclusion of the case, propofol infusion was discontinued, patient emerged without events, and the SuperNO2VATM Device was removed. She was transferred directly to Phase II recovery and ultimately admitted to the neurological step down unit. UThis case suggests the utility of fixed flow variable positive airway pressure by connecting the SuperNO2VATM Device to a standard anesthesia pressurized device (e.g., anesthesia machine or Mapleson circuit) to maintain upper airway patency and maximize oxygenation and ventilation in AIS patients with respiratory disease undergoing deep sedation during endovascular therapy. Differing from other modalities that require high FGF such as HFNC and conventional continuous positive airway pressure (CPAP) machines, the airtight seal provided by SuperNO2VATM device allows for adequate positive pressure generation with low FGF. At only 10 l/min from the anesthesia machine and partially closed APL valve, the reservoir bag is filled and pressurized, giving expiratory pressure to maintain airway patency and provide PEEP. On inhalation, a pressure drop is appreciated and may be augmented by manually squeezing the reservoir bag (Fig. 3). No capital equipment (high-flow oxygen regulators or CPAP machines) is required in this setting as the SuperNO2VATM Device connects to all low FGF anesthesia equipment readily available in the procedure room, such as an anesthesia machine or Mapleson circuit connected to an oxygen source. While the nasal cannula or non-rebreather with capnography is effective oxygenating devices, they are ineffective in the setting of poor respiratory status, upper airway obstruction, or central hypoventilation and have been associated with hypoxemia in 25% of endovascular therapeutic procedures and up to 54% of other deep sedation procedures [9, 10]. Some literature supports the use of high-flow nasal oxygen during sedation; however, it has been only marginally effective in the morbidly obese and critically ill populations [11, 12]. With FGF >40 l/min, HFNC also limits the ability to monitor EtCO2, and although the use of monitoring EtCO2 in an open system only provides qualitative data, the data are sufficient to determine whether or not the patient is apneic or requires support. Intraoperative CPAP has also been shown to be safe and effective in a variety of deep sedation procedures. However, it is complex, difficult, and expensive to set up, and its use is seen in <20% of indicated patients due to its complexity [13, 14]. By design, it delivers a constant pressure, reliant on widely variable FGF rates depending on the significance of mask leak. If leaks are significant, FGF up to 100 l/min is necessary, limiting the ability to monitor EtCO2 and requiring capital equipment to be brought into the procedure room (e.g., CPAP machine). Recently, nasal EPAP devices have been shown to treat obstructive sleep apnea; however, they lack the ability to deliver oxygen, monitor EtCO2, and provide ventilatory support to the lower airways . We report the successful use of a novel technique, nasal variable positive airway pressure, which utilizes an airtight nasal mask connected to an anesthesia machine with a fixed low FGF (<15 l/min), providing EPAP, through the APL valve. The airtight seal allows for pressurization with low FGF, minimizing EtCO2 washout, and enabling continuous monitoring . EPAP creates a pneumatic stent in the upper airway to relieve obstruction, maintain alveolar recruitment, and maximize oxygenation. Manual squeezing of the anesthesia reservoir bag during inhalation allows for alveolar recruitment breathing to prevent oxygen desaturation during hypoventilation or for rescue mask ventilation in the setting of apnea. VPAP through a nasal anesthesia mask and anesthesia machine may be considered as an airway management option for endovascular therapy and other procedures in patients with poor pulmonary reserve or those at risk for upper airway obstruction. However VPAP, like other positive pressure modalities, may cause gastric insufflation and therefore may not be indicated in patients who are full stomach or at increased risk for aspiration. In addition, this single case report is hypothesis generating at best and requires formal prospective analysis to demonstrate efficacy in high-risk patients undergoing sedation anesthesia. We report a case of successful anesthesia for endovascular therapy on a frail patient with poor pulmonary reserve using VPAP with the SuperNO2VATM device connected to an anesthesia machine. This method may be considered for airway management in patients presenting for endovascular therapy under deep sedation. This technique may prove to be particularly useful in patients with compromised respiratory status or those at risk for upper airway obstruction under sedation anesthesia. Formal prospective studies are necessary to fully elucidate its clinical impact. With stronger evidence supporting the use of sedation over GA, newer devices and techniques are necessary to support upper airway patency and ventilation. High-flow nasal oxygen and CPAP therapies show some promise but require capital equipment and are not cost-efficient in most procedural areas. The SuperNO2VATM device connects to standard anesthesia circuitry, using already available equipment to provide nasal variable positive airway pressure support to high-risk patients under sedation. 3. Talke PO, Sharma D, Heyer EJ, Bergese SD, Blackham KA, Stevens RD, et al. Society for neuroscience in anesthesiology and critical care expert consensus statement: Anesthetic management of endovascular treatment for acute ischemic stroke. J Neurosurg Anesthesiol 2014;26(2):95-108. 4. Jumaa MA, Zhang F, Ruiz-Ares G, Gelzinis T, Malik AM, Aleu A, et al. Comparison of safety and clinical and radiographic outcomes in endovascular acute stroke therapy for proximal middle cerebral artery occlusion with intubation and general anesthesia versus the no intubated state. Stroke 2010;41(6):1180-1184. 5. Hassan AE, Chaudhry SA, Zacharatos H, Khatri R, Akbar U, Suri MF, et al. Increased rate of aspiration pneumonia and poor discharge outcome among acute ischemic stroke patients following intubation for endovascular treatment. Neurocrit Care 2012;16(2):246-250. 6. Abou-Chebl A, Lin R, Hussain MS, Jovin TG, Levy EI, Liebeskind DS, et al. Conscious sedation versus general anesthesia during endovascular therapy for acute anterior circulation stroke: Preliminary results from a retrospective, multicenter study. Stroke 2010;41(6):1175-1179. 7. Davis MJ, Menon BK, Baghirzada LB, Campos-Herrera CR, Goyal M, Hill MD, et al. Anesthetic management and outcome in patients during endovascular therapy for acute stroke. Anesthesiology 2012;116(2):396-405.
with first-ever stroke. J Neurol 2000;247(1):41-47. 9. Manninen PH, Chan AS, Papworth D. Conscious sedation for interventional neuroradiology: A comparison of midazolam and propofol infusion. Can J Anaesth 1997;44(1):26-30. 10. Mehta PP, Kochhar G, Albeldawi M, Kirsh B, Rizk M, Putka B, et al. Capnographic monitoring in routine EGD and colonoscopy with moderate sedation: A prospective, randomized, controlled trial. Am J Gastroenterol 2016;111(3):395-404. 11. Patel A, Nouraei SA. Transnasal humidified rapid-insufflation ventilatory exchange (THRIVE): A physiological method of increasing apnea time in patients with difficult airways. Anaesthesia 2015;70(3):323-329. 12. Rummens N, Ball DR. Failure to THRIVE. Anaesthesia 2015;70(6):752-753. 13. Cabrini L, Nobile L, Plumari VP, Landoni G, Borghi G, Mucchetti M, et al. Intraoperative prophylactic and therapeutic non-invasive ventilation: A systematic review. Br J Anaesth 2014;112(4):638-647. 14. Chung F, Nagappa M, Singh M, Mokhlesi B. CPAP in the perioperative setting: Evidence of support. Chest 2016;149(2):586-597. 15. Berry RB, Kryger MH, Massie CA. A novel nasal expiratory positive airway pressure (EPAP) device for the treatment of obstructive sleep apnea: A randomized controlled trial. Sleep 2011;34(4):479-485. How to Cite this Article: Pedro MJ, Gidaro M, Cataldo SH. Nasal variable positive airway pressure, a novel non‑invasive airway technique to supplement deep sedation during endovascular therapy in a compromised pulmonary patient: A case report. Journal of Anaesthesia and Critical Care Case Reports May-Aug 2017;3(2):34-38.